The Ringing Cedars - Articles: Megre's Confession. The author of the series of bestsellers about Anastasia, the reclusive woman from the taiga, was interviewed by a correspondent from Vecherki. No, he's not a writer, nor a publicist, nor a journalist. His language has been called "old-fashioned." Vladimir Megre puts out his books gradually, avoiding publishers. They sell out quickly. 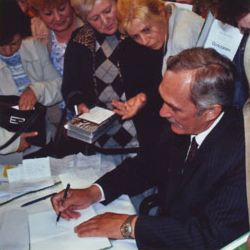 The books are read throughout all of Russia, and in many Western countries as well. The author's ideas about people returning to their roots, about building their own "space of love" - a kin's domain on an area of one hectare of land - have struck such a cord in people's souls that they have begun to unite in an ecological movement. In Ufa alone about 300 persons have come together around the "Ringing Cedars of Russia" series of books. "I have never been in your city before, but I heard that the residents of Ufa are actively involved in the construction of kin's estates," Vladimir Nikolaevich began the conversation. "The people made a great impression on me. It made me sincerely happy when, at the conference, quite a young man came to the podium and firmly stated: �I will have my own house, my domain, and I will have many children.' People dream, they make plans, and this should work out. I am grateful to the Supreme Mufti Talgat Tad-zhunni for the invitation to the conference. I was able to meet face to face with politicians and leaders of religious faiths. And it was the first time I communicated with a spiritual leader of such a high rank as the Supreme Mufti in public, openly, in the presence of others. The Mufti has done a great thing, he has been able to unite people of various faiths at a conference devoted to ecology and spirituality. And this happened somehow naturally and seemingly imperceptibly." A question, which, I am sure, you are asked at each meeting: does Anastasia really exist, or is she only an artistic image that you use when attempting to bring the kernels of your ideas to your readers? The image exists, the real woman exists as well. The question involves something else: to what extent does this image correspond to the prototype. It goes without saying that the real Anastasia is better, more interesting than the one in the book. And in general I think that it is time to end the discussions on this topic, whether she exists or not. I have already published seven books. In a year I receive (by mail alone) approximately 15 thousand letters. Take a look at the Anastasia.ru site: hundreds of people dedicate poems and songs to my heroine - a separate collection could be published now. Can you recall any individual or image that over a short period of time elicited such a powerful poetic commotion? And do you know what the poems are about? About faith, about love for Russia. Do you think that I myself wrote Anastasia's inspired mysterious monologues, which have now been taken up seriously by scholars? Can I stop writing about Anastasia? I don't know.... This would mean stopping speaking about the problems surrounding a healthy way of life. The modern way of life, not only in Russia, by the way, is a dead-end. Anastasia offers us a way out of this impasse. How can I not write? The "Ringing Cedars of Russia" movement and the people creating ecovillages are developing independently of you, even though Megre is in demand as never before. People dream of meeting him, speaking with him, getting his advice. Are you not burdened by the onus of responsibility for all that is going on? I attempt to look at everything from the outside and understand it. I realize that I bear a certain share of responsibility. Sometimes it seems that I don't deserve any of this. I think that the wave of popularity of your books has washed up a spume of false Anastasias onto the shore. They appear from time to time. It Altai, a woman wrote a book entitled I Am Anastasia. Another imposter came to one of the conferences - in appearance she really did resemble the portrait of Anastasia that decorates the book cover. By the way, you should notice that my books are protected by a special mark: the cover bears the stamped gold foil logo of the "Ringing Cedars of Russia" series. I have heard that expeditions have time and again equipped themselves for the Siberian taiga - are they trying to find Anastasia? And the intentions of these people are not always good. Anastasia teaches us how to cure ourselves with plants, and the pharmaceutical companies, for example, do not like this. And one good farmer from Germany succeeded in finding her. Unfortunately, there were attempts to kidnap her, photograph her. I always appeal to my readers and ask them not to touch her, not to disturb her. In the distant Siberian taiga, this reclusive woman is raising your son. Today the boy is eight years old. Is a "happy ending" possible in this fairy tale? Every person should have his or her space of love. Many people are surprised at the peace and harmony in which Anastasia coexists with wild animals. But what is so strange about that? She has domesticated them, as one domesticates cats, dogs, horses. They live on the same territory, Anastasia is an integral part of nature. I am often asked, "Would Anastasia and her son ever want to move to Megre's kin's estate?" I have most like not yet found a place where I could invite her.... Obviously, a man must do something for a woman that would make her want to go to him herself.